Plastic price tag, or plate for coin slots on Williams 2- and 3-slot coin doors, used from mid-1960s to mid-1980s. 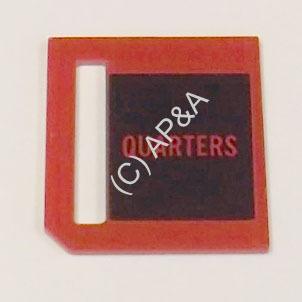 Quarters tag, red with black background. Replaces Williams part #s 16-8715-3 and 16C-8715-3. Aftermarket reproduction part. Measures 1-5/8 inches wide, 1-13/16 inches high.